Kathy Briant who lost a daughter in 2009 talks about her book and her experience with death from suicide and grieving. I did a workshop on Grief and the holidays and one suggestion I really liked and will implement it. I got 4 little frames – Santas with a space for a photo and will put a picture of Shannon in one and Ben in another, then do a set for my sister that is the same. We can put the decorations on our trees and have a reminder of the two we lost. That feels very good to me. Remember to keep some energy for yourself this season and allow yourself some wiggle room to get out of commitments you can’t/don’t want to do. Keep the traditions you like and let the others go. Best wishes for the Holidays. 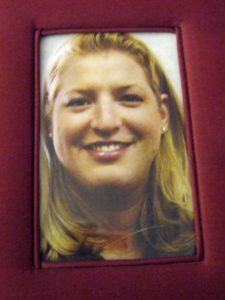 Kathy’s daughter Shannon, an artist, took her life in 2009. After a long battle with mental illness, Shannon thought nothing would ever get better so she swallowed every pill she could find and went to bed. People may remember the many art shows Kathy held and continues to hold, to promote the art Shannon would never take out of the closet, and engage people in discussions about suicide, mental illness and the life of an artist. The journey through grief is a gut wrenching process. Kathy’s world was turned upside down and she went through reactions and behaviours that she found strange and was double traumatized, both by the loss of a child and the loss of herself. 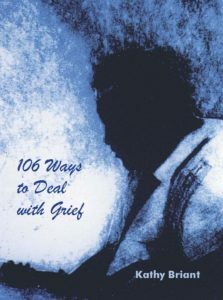 This book, 106 Ways to Deal with Grief is the result of that journey through rough seas. Anyone who has lost a loved one will find solace in these words. This is a good book to read because no one going through the mourning process can concentrate long enough for a while to read the usual kind of book. This book is framed in easy to understand sentences and the reader can start and stop wherever they feel they want to. The statements are clear and realistic and give the grieving person a map to understand what they are going through. This book is designed to help a person undergoing one of the most difficult processes they will ever experience. Also valuable for individuals and professionals, it provides an understanding of the grieving person. 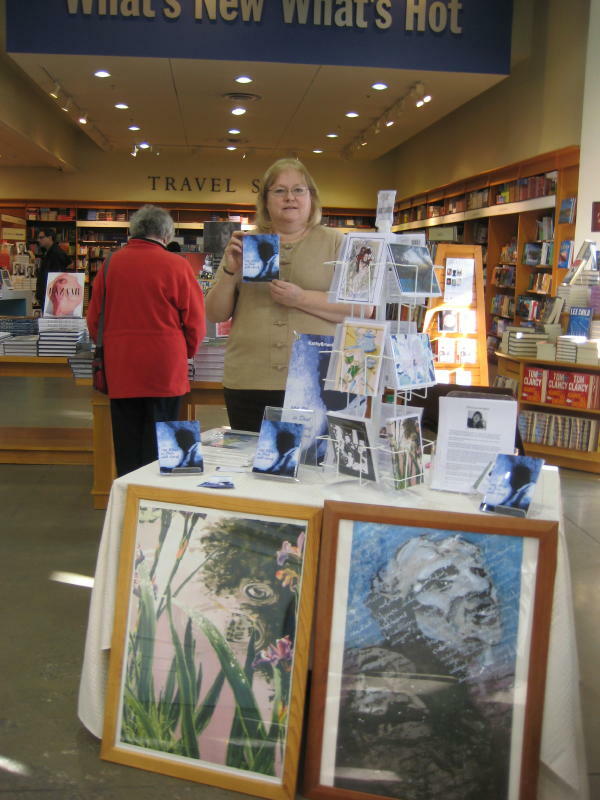 Filled with Kathy’s personal experiences as well as the process others underwent, the statements help others to understand the grieving person. If you know someone going through the grief process, this is the book they need and you need to understand them. Getting through the holiday season may be difficult for those who have experienced the death of a loved one. Participants will explore practical ways to approach the holidays. 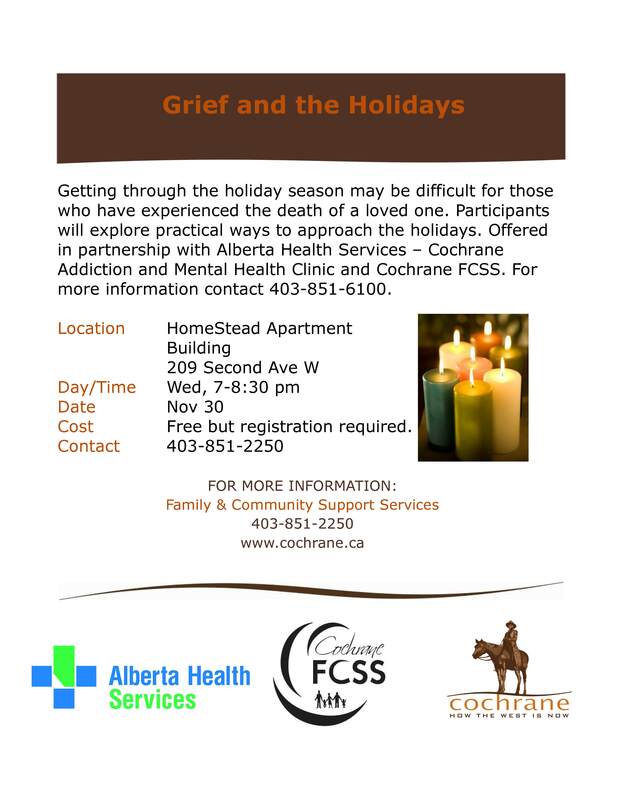 Offered in partnership with Alberta Health Services – Cochrane Addiction and Mental Health Clinic and Cochrane FCSS. Kathy will talk about how she came to write the book, “106 Ways to Deal With Grief” after the death of her daughter, Shannon by suicide, what it contains and who it is designed to help. Books will be for sale and some of Shannon’s art and cards will be available to view.